Stage 02, 2017 will probably be my favorite of all time in Dakar history. Not because of the main story, but because of the story behind the story. In fact, the main story was right on script. The cars gave us what we expect, with Sebastian Loeb and Peugeot gaining ground, clawing a small overall lead (38 seconds) away from Nasser Al-Attiyah in the Toyota Hilux. The bikes gave us Australian Toby Price, pushing harder still on the KTM and making it look almost easy. Paulo Goncalves is a few minutes back on the Honda though, ready to show us he can ride the hell out of the worst terrain (which we haven’t seen yet). But you shouldn’t be reading this if you want that story. There are dozens of outlets, with paid journalists using satellites and helicopters and magical voodoo to give you second-by-second coverage. They tell the story of the people who can really race. If you are reading this, you care about the stories of people who can’t not race. The people so driven they don’t know what else to do but race. There are plenty of those stories in Dakar, but for the last three years, there has been one story in particular I have followed, because it has been even bigger than Dakar. Lyndon Poskitt has been living and breathing his dream, Races To Places. Lyndon gave up his job, sold his home and possessions, and built Basil, his KTM race bike. Not meant for long distance riding with modification Lyndon and Basil have been riding every continent on earth, entering rally raids from Mongolia to America, Africa to Australia. Someone needs to have a rally on Antarctica just so Lyndon can finally come home! It doesn’t seem like anything else will stop him. 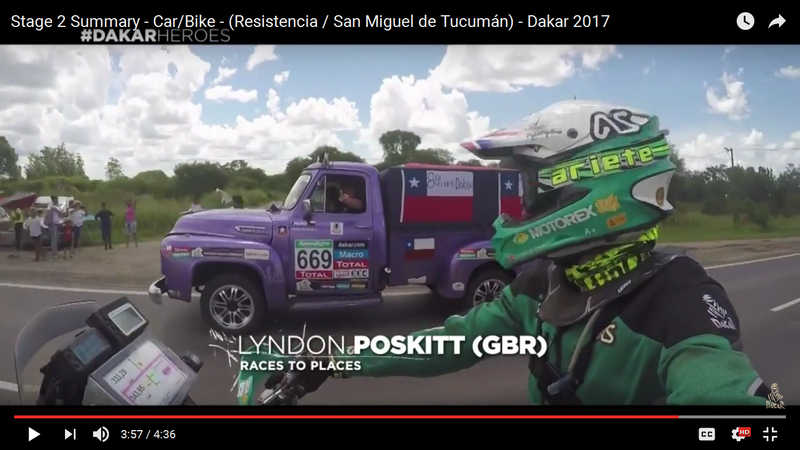 This is not Lyndon’s first Dakar, and with some help from Motorex, Adventure-Spec, KTM, and crowd funding from the fans he has picked up with his Youtube channel (hosted on the Adventure-Spec Youtube channel), Lydon has hit Dakar Legend status. Lyndon Poskitt meets the nicest people on the road. Photo: Screen grab from official Dakar Stage 02 Recap found on youtube. Along with copious social media appearances (the light green color of his Motorex sponsor stands out), he has already popped up in several videos hoisting huge wheelies and playing to the large crowds. But he managed two even bigger feats during Stage 02. First, Lyndon got his own “moment of the day” on the official daily recap video (starting at 3m25sec). 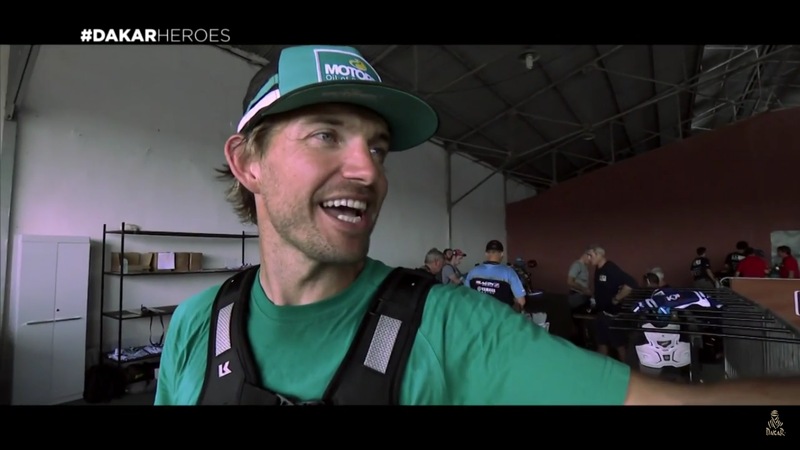 It seems they may end each days recap with more personal video clips, using hashtag #dakarheroes. This massively obviously increases anyone’s cache who might be featured, as it did for Tom Coronell and twin brother Tim. They raced buggies several times (including this year), but they are one-man vehicles and use a motorcycle engine. The craziness of going solo in such a small machine created a cult of fame around both brothers but especially Tom (not that they weren’t already well known racing drivers to begin with mind you, though on pavement). But knowing that it takes more than 15 minutes of fame to make you a Dakar celebrity, Lyndon found himself a good old fashioned scandal. “Feet-gate” you could call it, since everything needs to be buzz-worthy and tragically hip on the internet. Let me just give you the straight dope. 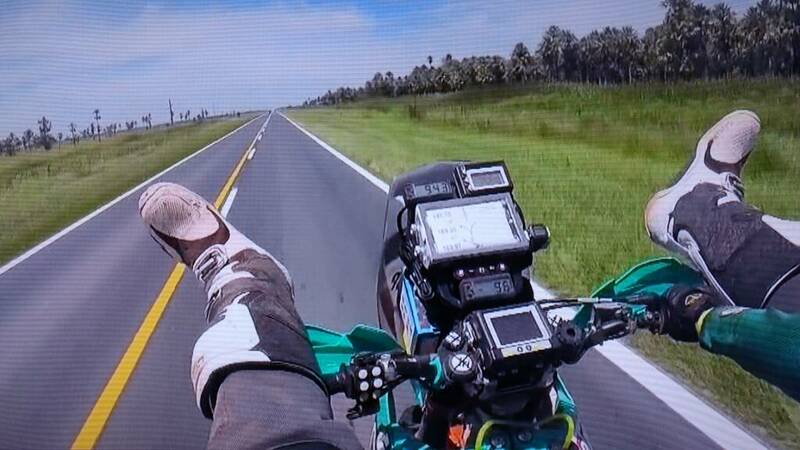 Video surfaced on the Dakar Rally’s social media accounts of Lyndon riding with his feet up on the handlebars. This was on an un-timed section of the course (as in, not while racing), at low speed, but the Twitter-verse is full of, well, twits. Commenters called it hooliganism and called for his disqualification. Personally I call them wet blankets and call for their disqualification from commenting on motorsports. See how fun the internet is? The important thing is, Lyndon is in 39th position at the end of Stage 02, and 2nd in the Malle Moto class, where riders are unassisted by support crew and must perform all maintenance and repair on their machines (except tire changes at the bivouac). If the Dakar officials are as fun loving as their media arm, Lyndon will not incur a penalty and he can keep battling for a win. His 2013 finish at Dakar was 46th overall, so there is also that finish to try and better. Mugging for the camera. Photo: Screen grab from Dakar official press video. Expect to see him and the other Malle Moto riders slowly fall down the order. The question will be, how far? It is inevitable that, as they continue to work on their bikes and sleep only two or three hours per night, fatigue will slow them on the race course. They may only race, say, 100 miles in a day, but they can easily traverse 500miles total, going from sand dunes to freezing mountain passes. Riders do their own navigating, searching for checkpoints to get a time stamp, then finding a specific piece of ground with their container of tools and spares. One container in a tent city that was set up while they were on the road. Then, unpack, set up the tent, pull out the tools, and get ready for the next day. Maybe some food would be nice? 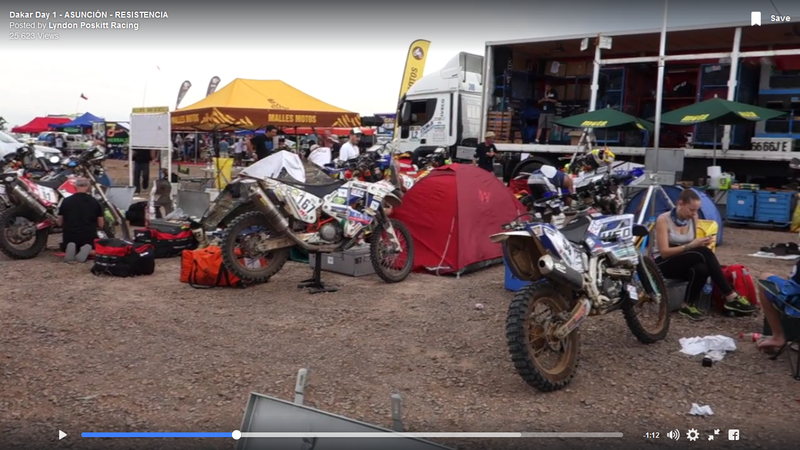 Bivouac for Malle Moto riders at the end of Stage 01, Dakar 2017. Photo: Lyndon Poskitt Racing. So, as per the usual, the official Dakar website is difficult to use but is still there, and the app also exists. If you want to follow the front teams things are easier. If you want to follow anyone else you need to understand how live timing works, where the checkpoints are, and what you are looking at. If you want anything better, international coverage is a better bet. Coverage is abysmal in the US and that is just a fact of life. We watch people race in circles because it is easy to understand. Write your Congressman; I have no control. Malle Moto tracking is best done at Tracking Dakar, since the official website tracks all the bikes as one category. There are only 11 of more than 130 motorcycle entries attempting the rally unassisted. You will only get a time sheet, but it is more than anyone else gives you. Be thankful for awesome people, providing free services. The ADVRider.com forum also has a thread with copious information about the event. Post #4 has links to TV coverage on different continents, if you are good with understanding time zones and foreign languages. It really gives you perspective just how crazy this event is when simply trying to follow it from home is this daunting. When you are done, it feels as though you should get some kind of participation trophy or an “I survived” T-shirt. Imagine actually being there. Better get your passport out for next year: Paraguay is quite warm this time of year I am told.